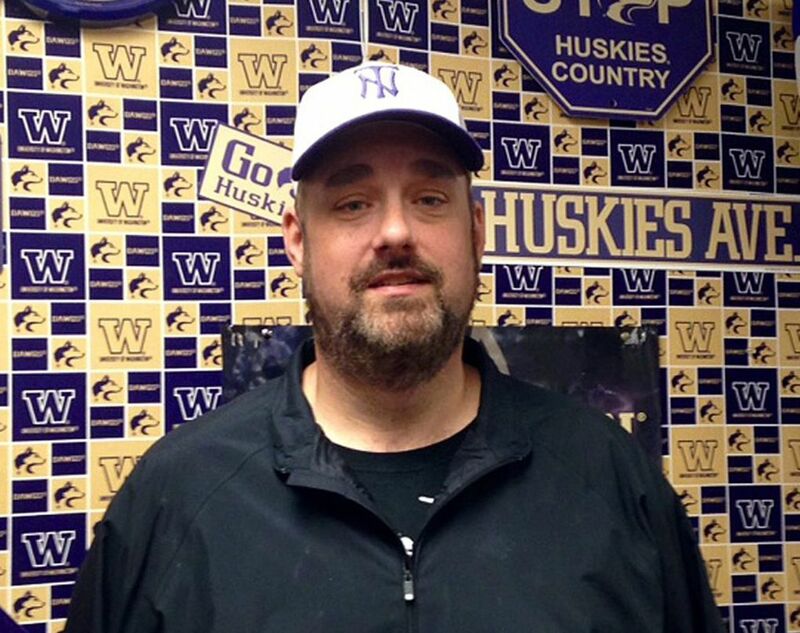 Teacher Brady Olson is being hailed as a hero after tackling a student who fired two shots into the air at North Thurston High School. LACEY — A popular teacher is being hailed as a hero after tackling a 16-year-old student who fired two shots into the air Monday at North Thurston High School, police and students said. No one was injured after the teen shot toward the ceiling in the school commons before classes began, authorities said. The shooter is in custody. Students say Brady Olson, who teaches Advanced Placement government and civics, stopped the shooter. Anthony Rybalkin, 16, said he and a group of friends were hanging out near the lunch tables when he heard a loud boom. He looked up and saw a classmate from his sixth-period class walking down the stairs from the gym into the common area with a cigarette in his mouth and a gun in his hand. Rybalkin tripped and fell as he ran away and turned his head to see if the shooter was coming his way. That’s when he saw Olson come up behind the shooter and tackle him. Two other teachers or administrators jumped on the teen and held him down, Rybalkin said in a phone interview a few hours after the shooting. Olson said he did what any other teacher in the U.S. would do: He ran toward the gunfire instead of away from it. “When Mr. Olson tackled him, he still had it (the gun) in his hand. I don’t know if one of the other teachers took it or not,” Rybalkin said. He said the shooter was a new student and had joined his class within the past week or so. “He said he has military parents. We don’t know if that’s true or not,” Rybalkin said. School district spokeswoman Courtney Schrieve confirmed that the shooter was enrolled at the school, but she didn’t know how long he had been a student. Schrieve said the school was being swept for a bomb as a precaution and wasn’t sure if students would be returning to class Tuesday. “The dangerous thing is it was right before school starts. The kids would have all been in the commons,” Schrieve said. The district had just been practicing safety drills and active shooter drills, and “it obviously paid off,” she said, touting Olson as a good person. “He’s a very large guy, he’s a very popular teacher, and I can see him doing that,” Schrieve said. Olson says three other staff members reacted the same way when the student started shooting. Another student who saw the shooting but did not see how the shooter was stopped was not surprised to hear it was Olson. Patan, a senior in one of Olson’s civics classes, was swept into a classroom and then escorted out of the building after the shooting. He described his high school as nice and calm, with no bullying. 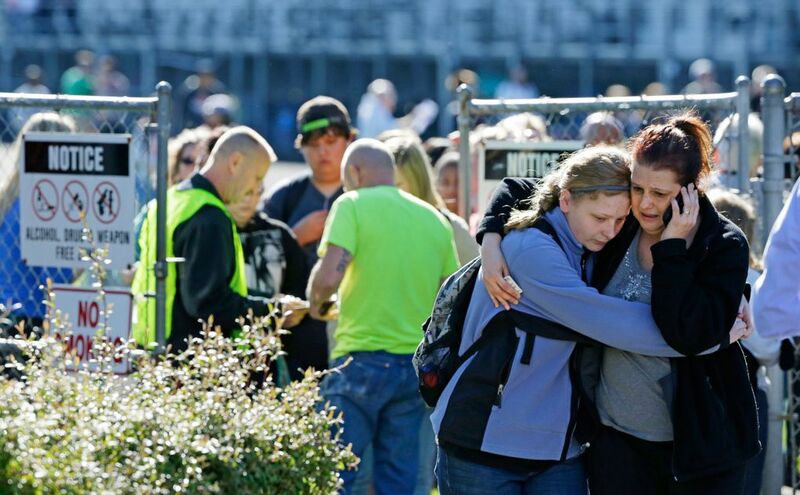 The shooting comes just months after another one in Washington state left five students dead, including the gunman. In October, 15-year-old Jaylen Fryberg shot the students and then himself after inviting them to lunch in the cafeteria at Marysville-Pilchuck High School north of Seattle. All athletic events are canceled, according to the school’s website. Students were released to their parents at the football stadium.